Cloudflare launched its 1.1.1.1 ‘privacy-first’ consumer DNS back in April, in partnership with APNIC. It maintains the claim that this service is the “fastest public DNS resolver in the world”. 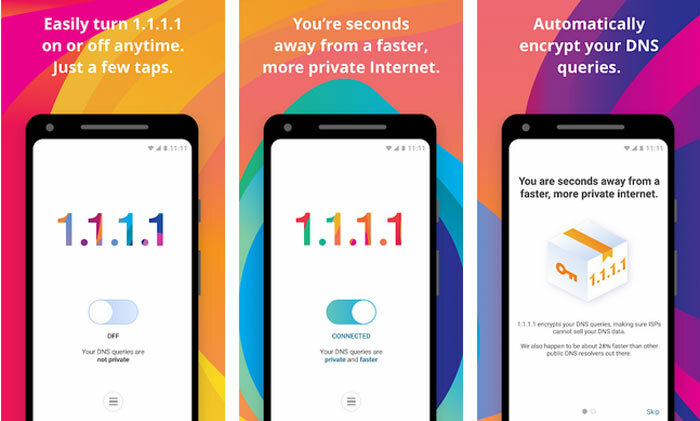 Now Cloudflare has released 1.1.1.1 mobile apps to make using its alternative DNS “incredibly easy” on your Android or iOS phone or tablet. First, to recap on why you might want to change your DNS. There are numerous potential benefits but the main two are headlined speed and privacy. With regard to the former, Cloudflare 1.1.1.1 is claimed to offer a query speed of 14.61ms in data shared by DNS Perf over a recent 30 day period. That compares very favourably with the second placed OpenDNS (22.86ms), SafeDNS (42.54ms) and fourth placed Google (43.53ms). Your default DNS, provided by your ISP, might well fare worse than these top four performers. Another touted benefit of 1.1.1.1 is that your internet connection will be safer. The Cloudflare DNS doesn’t collect your data, monitor or censor sites visited – something that your ISP might do for various commercial or legal reasons. The 1.1.1.1 service will “never log your IP address,” as guaranteed by KPMG auditors. However, one must remember that an ISP can monitor transferred data beyond your DNS query. If you are interested you can head on over to the appropriate store for your mobile device to grab the 1.1.1.1 app. It is free to use (no ads either) and when launched you will see a very simple toggle – slide to turn on Cloudflare’s 1.1.1.1 DNS – or to turn it off for any reason. Some users have queried the app’s permissions. Since the initial release mic access permissions requests have been removed. Now the app still asks for Photos/Media/Files and for Wi-Fi connection information, due to the Instabug reporting library used by developers. The files access is only used to attach screenshots for bug reports. You can read more about the 1.1.1.1 mobile app via Cloudflare’s blog and comments section and the Android and iOS app store pages. OK, I've basically given upon this one for now because it will turn off when you reboot, and sometimes in other cases, silently falling back to the provider DNS.